In a HardTalk interview first broadcast on 3 April 2008, Sarah Montague talks to the Prime Minister of New Zealand about the so called "third way" politics and what it actually means. World leaders from around the globe are in London this week for a summit of progressive governments. 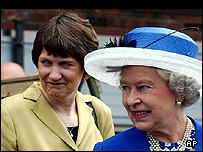 Helen Clark who has been Prime Minister of New Zealand since 1999 has been compared to Tony Blair for her adherence to the so called "third way". But given that so many other "third way" leaders have since been voted out of office, is there a future for her ideology? She talks to Sarah Montague. HARDtalk is broadcast on BBC World at 03:30 GMT, 08:30 GMT, 14:30 GMT, 18:30 GMT and 21:30 GMT. Hardtalk can also be seen on BBC News 24 at 04:30 & 23:30. Sarah Montague asks Helen Clark, Prime Minister of New Zealand, whether the time is right for a referendum on becoming a republic. Prime Minister Helen Clark talks about her goal for New Zealand to become carbon neutral by 2025. New Zealand has recently become the first developed country to agree a free trade deal with China. How does this relate to her agenda of progressive politics?